On Christmas Eve day Faye and I adopted a young black Lab found running at large in Illinois, who was turned in to a local shelter and found his way to The Lab Connection, a rescue group who served us well when we adopted Budda two years ago. We named our new pack member Gandhi and planned to set out on Christmas day to buy presents for our three Labs. I took Gandhi to the barnyard paddock and left him with our other boys, secure in the belief that our 5' tall wire mesh no-climb horse fence would hold him. When I walked to the house and went inside I was shocked to see Gandhi waiting there beside my wife. Hoping I had neglected to shut a gate I walked Gandhi back to the barnyard and was dismayed to find everything secure, meaning our new dog was capable of climbing fences. Sure enough, I watched him put his forepaws in the wire mesh and pull himself up, perching on all four paws on the top of the fence like a gymnast before hopping down. He even stuck the landing. Not knowing how we could improve our large barnyard fence, we bought a dog kennel and placed it in the house. The foster family assured us Gandhi liked his kennel so we thought that would afford a short-term solution, but when left alone he began chewing the wire kennel and pulled it apart one jagged piece at a time. Separation anxiety is common with rescued dogs and we were left with no clear solution, other than giving him up for his own good to a family that could keep him indoors at all times. It was a depressing prospect and my wife suggested doing a web search to look for solutions before making a decision. 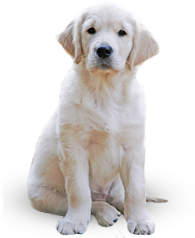 The first solution I found was Best Friend Fence and their heavy duty dog fence made of polypropylene sounded simple and effective. In fact, it sounded too good to be true. Even so, we checked with six local fence construction companies and sought bids. Their solutions ranged from giving Gandhi electric shocks for approaching the fence to tearing down perfectly sound fence and replacing it with a higher fence, at absurd cost. The most cost effective and logical choice was the product offered by Best Friend Fence, which I could install by myself. Joan Camilli was the service representative who helped me and we swapped numerous emails as I investigated different options, finding a solution within my budget. After placing the order I received the shipment within a few days, in perfect condition. Installation was simple and proved completely effective. Our tall athletic Labrador has tried and failed on several occasions to climb our improved fence, but given the flexible nature of polypropylene, the small mesh and the 7'4" height, Gandhi has remained unable to endanger himself and remains safely in our half-acre dog enclosure when I must leave the dogs. I don't know what we would have done without Joan's help and good advice. Thank you for enabling us to keep our commitment to give Gandhi and long and joyful life in the countryside with us. We live on Nantucket where we have a huge deer population that is almost unmanageable. We had to protect a recently planted vineyard. Our lawn maintenance firm suggested Benner's Gardens. Benner’s "on-line" link is well thought-out and their personnel consulting excellent. The product was delivered on time as promised. Installation was relatively easy and everything worked and went together as expected, NO Surprises! The best part is that the deer fencing and poles blend in with the natural surroundings and keeps the deer out. The cost to value is terrific. 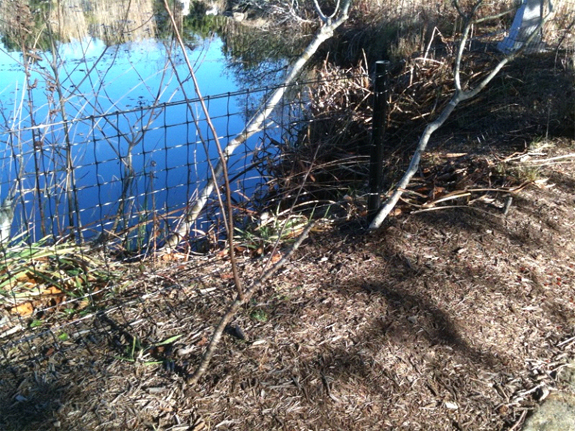 Thank you very much for your gift of deer and rodent fencing to the North Carolina Botanical Garden designated for the Carolina Campus Community Garden. 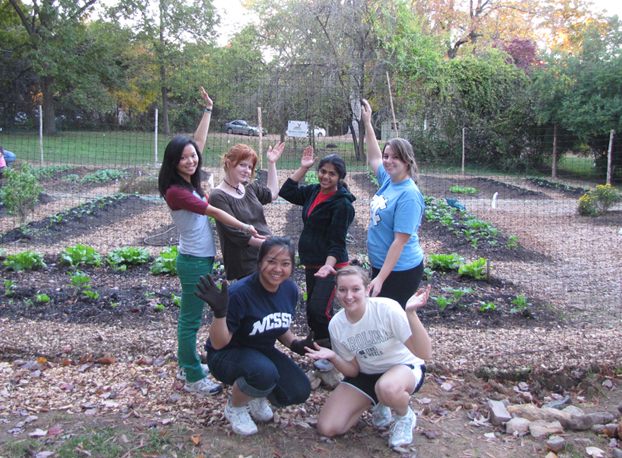 We have notified Clare Lorch of your kind donation and are grateful for your support of our Campus Community Garden. I purchased your product (Bow Wow Barrier) this summer, and my sister and I successfully created a fenced in area for our dogs!! Works great! We had a nice wooden fence that enclosed our backyard so that our newly rescued dogs (whippets) could go outside off leash. But, we learned that one of them could easily jump the fence. Our male dog started to fight with neighboring dogs over the fence and had actually bitten them. We weren’t sure how to resolve this problem without tearing down a perfectly good fence and replacing it with a taller one. An estimate for doing the work was nearly $4,000. 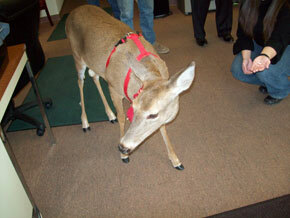 Fortunately, I learned about Benner’s deer and dog fence. It was fairly easy to put up and has prevented problems with our dogs (and our neighbors). Since it is mesh, it didn’t hide the wooden fence we have but gives us the protection of a taller fence. Now we can work on our pet’s behavior without worrying about our neighbors. 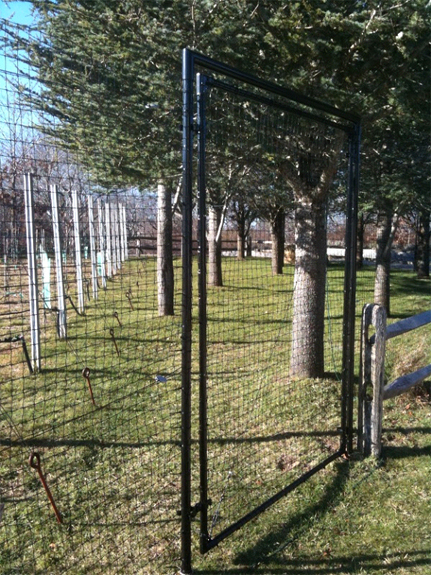 Without this fence we would not be able to safely let our dogs out in the yard. I purchased a very large roll of your standard deer fencing probably more than fifteen years ago. 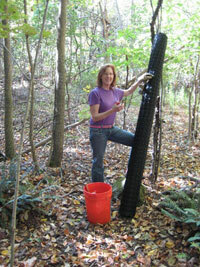 We used it to enclose a large vegetable garden and it worked wonderfully. We have since moved the garden and moved the fencing as well. This product is pretty indestructible! And we have used it for so much more than just enclosing our garden for deer protection We have used it as a cover for our chicken runs. 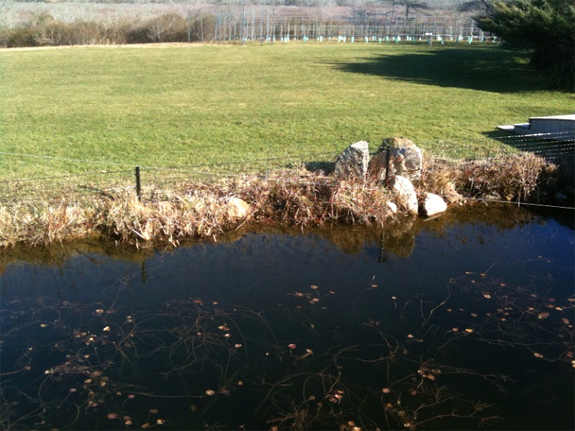 We have covered our ponds to keep herons and raccoons out. We’ve used it as a trellis for growing gourds and other climbers. I’m sure we’ll come up with many more uses as well! We put up 300 ft of fencing last year and we are having so much FUN finally having a garden! This product is awesome and we recommend to everyone we know. Thank you for your generous and outstanding contribution to our Holiday season's Open House Event. It was a pleasure working with you, Joan Camilli, and your staff. Santa, his elves and his reindeer were greeting visitors and friends with candy canes, cookies and beverages. Snow was on the ground. It was quite a festive scene. The deer fence you provided made a great enclosure in which both children and adults could safely meet and pet Santa's reindeer, have pictures taken, and share time with one another. As an organization pledged to supporting and serving American Veterans, we appreciate your contribution to that mission by helping us raise awareness in our local community. On behalf of our membership, thank you again for your kindness, generosity and support. BEST FRIEND FENCE is perfect for the dogs in our Adoption Center to get out, stretch their legs, and run. 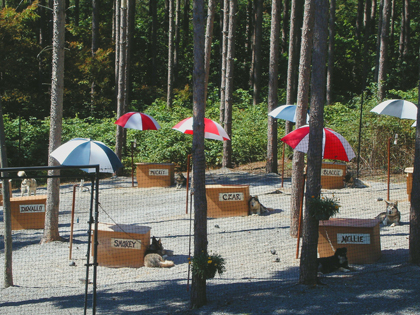 We have play groups of four or five dogs at once and they tear around the enclosed space. The fence is high enough that we don't worry about dogs jumping over it, it goes below ground so the dogs won't dig out, and it doesn't stand out… it blends right into the woods behind it. The best part about it was that it was really easy to install and fairly inexpensive for our purposes. 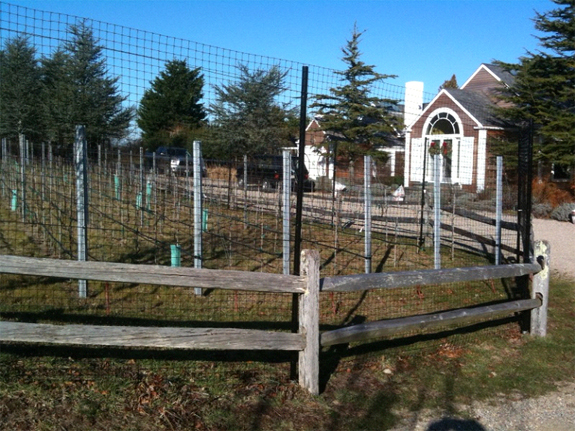 Overall, we're very happy with the fence, but here at the MSPCA in Nantucket, the dogs love it even more. Tracie Hotchner is the author of "The Dog Bible" and is a nationally known radio host of the live NPR show "Dog Talk" (www.dogtalktheradioshow.com). Also heard on Martha Stewart's show on Sirus Satellite Radio. I have three very serious hunting/chasing/digging/running dogs and would not consider using a fence that gives electric shock on them (for reasons I explain in "The Dog Bible"). The dogs cannot get out, even the young Weimeraner who can flatten himself like a snake under most fences. The deer cannot get in - keeping out their ticks and their destructive appetites. I put this fence up, all 12 1/2 acres of the perimeter, by myself and with a friend. Neither of us is especially tall or strong and once we got the hang of it, the job went swiftly and was really satisfying to know we could do this ourselves, "just two gals." The aesthetic beauty of the land is completely untouched - the fence is so hard to see that you can be nearly next to it and not realize it is there. Black is the color that makes things "disappear" and in the case of the Best Friend fence, only your dogs know it is there most of the time. Peace of mind - the dogs are safe whether I am home or away. Happy neighbors - the other great thing about the invisibility of the fence is that neighbors who heard me banging the fence onto trees came out worried I was putting up something ugly or intrusive - the funniest thing was that they were spitting distance from the fence and could not even see it! There are very few products to which I give "The Dog Bible" Paws of Approval but Benner's best Friend fence gets that seal of approval in a heartbeat. Author of "The Dog Bible"
Host of NPR's "Dog Talk"
Hi Joan. I purchased the small dog kit from you a few months ago and I just want to tell you that I love it BEST today!!!! 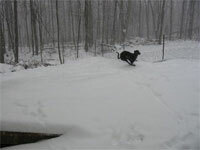 We have about 6" of snow on the ground and it's still coming (you may be having the same storm!) and I just let the dogs out to play and run and potty and watch them from the warmth of the house :-) I LOVE the fence and will be figuring out how big the next one will be for next year. I decided to keep this one in place and put a gate in it so that I will have a smaller area and then a larger area where they can really exercise and not tear up the grass so much :-) I'll eventually put a shorter fence around the front yard. Honestly that would be nice this weekend so I could shovel the drive while still keeping an eye on them, but that will have to wait for a while. 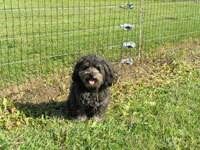 FINALLY I have taken pictures of our little dog, Otto, in front of your fencing, installed on our high tensile (formerly) electric fence. I have put up most of it and it has worked perfectly to keep Otto in our yard, safely away from the road, the sheep, mowers and all other potential dangers. The Hogringer is an excellent way to fasten the fencing to the horizontal wires. So fast and secure. Thank you for all your help deciding what to purchase and how best to install it. It is the perfect answer. Now I can put Otto outside without having to anxiously watch to be sure he is safe. Just wanted to drop you a note regarding our Benners Best Friend Fence. I believe we've had it now for about 5 years. Absolutely LOVE it. We have fenced approximately 2 acres to contain a great dane mix, greyhound, and dachshund. We had tried the underground invisible fence, but had problems with line breakage, dogs escaping & not being able to return to the area, etc. The Benners Best Friend Fence solved all of those problems. It's almost invisible so our view of the surrounding landscape was preserved. Our area had a major ice storm last year that took down power lines & even power poles. Our Best Friend Fence survived beautifully. When we first installed our fence, we didn't use the tension wire or the chewguard. When we got our dachshund mix about 2 years ago, I ordered the chewguard & installed it along the bottom. At that time, we also installed the tension wire along the top of the fence. This fencing is the best investment we've ever made. I will be ordering more as our daughter & her husband bought a house on 10 acres, near a major highway. We'll be able to enclose several acres to keep their dachshund safe, yet they'll still have the view of their pond. No doubt the fence will be installed in one afternoon. Thank you so very much for this wonderful product that has given us so much peace of mind over the years. It's easy to put up, attractive, and does a great job no matter what size dog you've got. 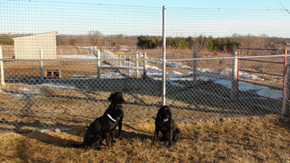 Attached is a photo (the dogs are actually outside the fenced area, but it's the only photo where you can actually see the fence). Oh yes we're very happy with it. The installation went well, everything is holding up fine, no chewing or digging problems from our three beasties, tensioners work well, system is reasonably attractive, gate works well, bracing posts do what they are supposed to, dogs jump and lean on fence all the time with no visible side effects. 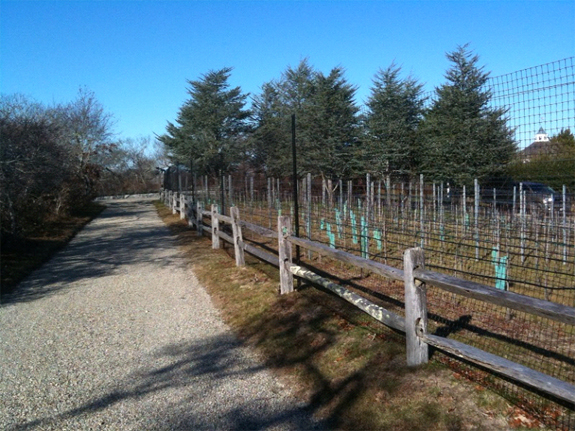 Near our house we saw a large olive orchard surrounded with 7' deer fencing, too. We have told a lot of people about your website and product. It was a good alternative to the $40/linear foot redwood fencing we have elsewhere. Speed was everything to us since we adopted 3 of my mother's dogs on short notice, due to her health problems..
We use this fencing for so many purposes. Our cottage is fenced on 3 sides, but the lake side is not fenced. 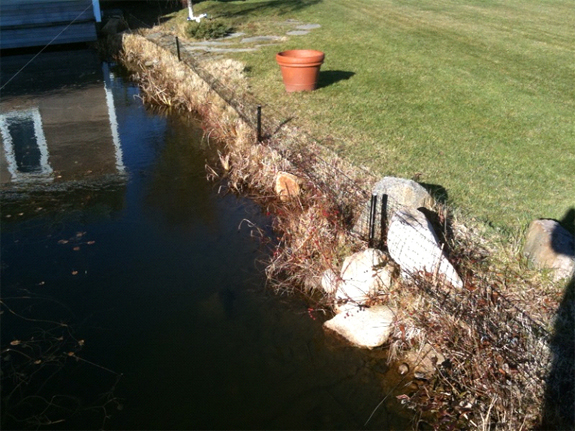 We use your fence to extend into the lake to keep the dogs from hopping in and coming out in the neighbor's front yards., during the winter along the shore to keep the dogs safe in the front yard (and off the thin ice), and to erect as temporary fencing which may be needed when friends visit with mulitple dogs. We used to use snow fencing for these purposes, but that is so ugly and falls apart quickly. My wife and I live in suburban Detroit. We own two dogs and use an Invisible Fence system at our home. Recently we bought a second home in northern Michigan. 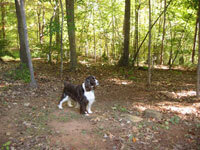 It's a very rural area and our house is on an acre of wooded land. Since the home serves as a vacation get away right now, we were concerned about training our dogs with an additional electric style fence so we started looking into physical fencing options. My wife stumbled onto your website and we ordered from you in August of 2007 . First, my wife did the ordering and said she found the woman she ordered from to be very helpful. The two of them went over exactly what we wanted to do, all of our options, and put the perfect package together for our needs. Second, everything was as advertised. The installation was surprisingly easy and, when we did run into questions, your people were extremely helpful. Second, the end result is exactly as promised. The fence itself is very attractive close up and virtually invisible from even just a short distance. We had two friends up last weekend that hadn't seen it yet and upon first sighting, I had to point it out . So in short, we are really pleased with our decision to use your fencing. The system is very well done and obviously designed by people who actually use it. Hello--you all installed our Best Friends Fencing back in, Nov. or Dec. I think it was. Kaye V's Roadrunner was his racing name. We brought him up from Derby Lane Greyhound Park in St. Petersburg, FL. in Oct. Here's two pictures of one of our greyhounds that we adopted.Remus is what we call him now. I LOVE BEST FRIENDS FENCE for one of my many, best friends Remus will stand against it and rub and push on it when I come home and it stays put. He's a strong 93 pounder too. We had the deer fence put up in the back part of the woods and we've seen the deer but not in the fenced area. I hope to add more fencing in the not too distant future. WE LOVE IT. Our group, Personalized Greyhounds, Inc. would be happy to take some of your brochures and add them to our GOING HOME package that every one gets when they adopt an ex racer. I'm sending a few photos for you to give you an idea of how the fence looks. Thanks again for all your help with getting it right! I have two dogs and a cat, Wizard, the blue heeler, DelOro, the brown aussie mix who is rolling in ecstacy in the back yard in that one shot, and the closeup, and my cat Destiny, on the small deck. It's hard to get good photos of the fence, since it blends in so well! . I am very happy with it, the way it looks, the ease of installation, and the way it defines and protects the back yard, making it look bigger and still not looking "enclosed". My dogs are enjoying all the space to run in, not to mention running back and forth along the fenceline while the dog next door runs back and forth along his fence line! All three of them barking of course. Luckily they get tired after a few minutes (DelOro is 13 and Wizard is 10) and all three of them just stand there panting and wagging their tails at each other! I'm enjoying being in the yard with them too. 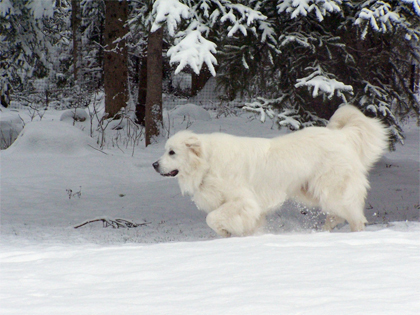 Cirra is a 2 year old Great Pyrenees and has done very well with the 7 foot heavy duty fence enclosure that we installed prior to her arrival. She loves her yard! We love the fence and recommend it to our customers all the time! The fence installation has gone quite well. We've completed putting the entire fence up but are still working on stakes and cables as time permits. 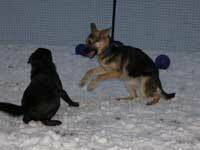 So far we are very pleased and so relieved to have a secure yard. 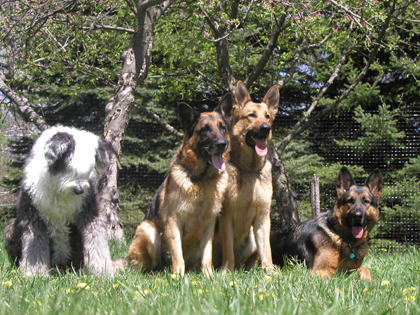 In any event, I thought you would appreciate a photo of "the guys": from left to right they are Dexter, Sito, Togo and Koz. Dexter was a visitor but the other three are ours and all adopted through various rescue programs. At the moment, we are all set for supplies but might contact you once we start working on the garden fence. Thanks much for all your help. I just wanted to thank you for your help and to let you know how much I LOVE my new Benners Gardens fence for my two dogs. I have been searching for a long time and until now I have not been able to find an affordable enclosure that I could feel good about. My dogs are so much happier being able to run free from any tie lines or leashes and I feel great knowing they are not being zapped or harmed in any way. I was able to install 200ft of fence in just 1 day, no problems whatsoever. The fence looks great and it really is invisible. Your company delivered on time quality product and my dogs and I will be enjoying years of freedom, thank you so much! Joan - thank you so much for all your help. The fence and gate arrived on Monday. I started installing the fence Tuesday and finished the next day. My husband was busy with clients so I put the entire thing up by myself! There are no words to describe how pleased we are with the results! The fence is virtually "invisible" and the most difficult part of the entire installation was to clear a path in order to place the fence. Delighted with the quality of your products. 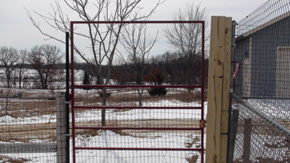 Everything that was provided for the posts, stakes and gate are very "heavy-duty" and made to last. I have given your company's name to a number of my neighbors and friends (all have 2-3 acre yards like mine). Hope you will be hearing from them soon. I have attached a couple photos - we are so delighted to have a product that will contain the dog, but keep the beautiful "open" look of our yard. If you look closely you can barely see the white deer "flags" hanging from the fence. Otherwise - it's invisible. Benner's Best Friend Fence is a fantastic idea. Having just moved to Virginia with 3 dogs, I had no idea how to keep the deer out and the dogs in. 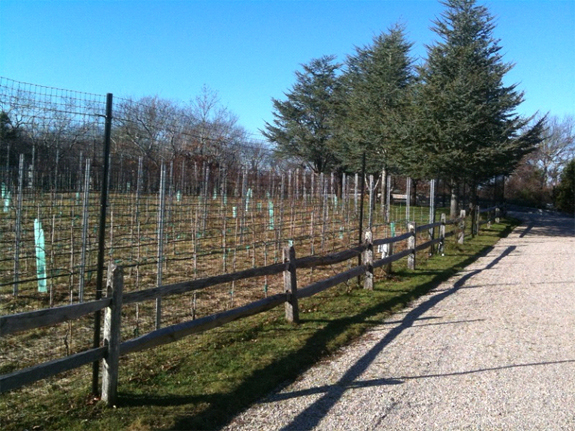 The fencing is virtually hidden, and we were able to put the entire fence up in a few hours. Benner's offers quick delivery and wonderful service. I would highly recommend their dog fencing product. We are very pleased with our fence. It holds in our little family of Yorkshire Terriers, and also our beloved Neapolitan Mastiff, Cosmo. It also keeps out Coyotes that would prey on our dogs were it not for this wonderful fence. I highly recommend this product, as it is very light, yet strong and good looking, not to mention it's easy installation. Finally, there is a fence that is easy to handle and looks good, too. We purchased one of your dog fences this Summer because we wanted a fenced in area for our two standard poodles that need a lot of exercise. Also, we wanted a fence that didn't hide the beautiful wooded area behind our house. Your fence fit the bill. It was a good product at a great price and fairly easy to install as well. It has also held up nicely despite the amount of snow we've had so far and does not rust! I've been approached by two friends who might want to get one for their pets and I shared your website. Thank you very much for the excellent customer service and the excellent product. It's such a pleasure to find a product that lives up to its promises and exceeds our expectations. The Benner's fence has been a great success for us. We've used it to enclose our 2-acre yard abutting conservation land and it's been fabulous in keeping the deer out and our four big dogs in. We were initially nervous about spoiling the woodland view with a tall fence, but--as promised--it's been virtually hidden. My husband and I are not terribly handy people, but we had no trouble installing the fence ourselves. The combination of the "Z" stakes and the tensile wire have kept the dogs in and thwarted the escape efforts of our most determined digger. Best of all, the cost of installing the Benner's fence ourselves was a fraction of the cost of other options for uglier, shorter, and less effective barriers. Since the Benner's fence has been in place, our gardens have flourished and we've found virtually no deer ticks in our yard or on our dogs. This has been a great solution for us, and we've recommended it to many friends. Thanks for a great product! I installed this myself, from 9 AM to about 2 PM. This was taking an hour for lunch. I have very bad arthritis in my shoulder and I was able to do it easily. It looks wonderful ! Bought 4' x 330' and access gate, for several dogs.